How single-players are being forgotten + new game update “Plunk”. What a few months! The weather has been atrocious, cold, hot, cold, wet! I have been busy with work for the last couple of months. We have a lot going on in terms of capital projects and implementation. Time to commit to hobbyist things took a back seat, I have managed to create a nice simple little “Pass & Play” game. You tend to find games are all about the social share. If you pass a level – share it. If you obtain an achievement – share it. Don’t get me wrong, this is great but sometimes the single player (offline) gets neglected. Not all games players want to share everything they do in a game. A majority of publishers are leaning towards the “Online” and “Multiplayer” crowd – which is great, I love a good multiplayer game. Campaigns have now almost become a weight for developers to include and especially when profit is proven by having micro-transactions and F2P models. Why not just give players a good decent single player game with a deep and thoughtful story that you can really get sucked into? A lot of single players keep coming back to title if they feel they can improve on a level to obtain another achievement or beat a level time. I had a friend who would play a game in single player and if he died, he would reset the level and try again attempting not to die everytime. Now that was commitment! KerPlunk is a children’s game first marketed by the Ideal Toy Company in 1967. The game consists of a transparent plastic tube, plastic rods called straws (normally numbering 26 to 30 in total and of various colours – yellow and red predominantly) and several dozen marbles. The base contains four separate numbered trays and the straws are passed through holes in the middle of the tube to form a lattice. The marbles are then placed in the top of the tube and held in place by the lattice. The onomatopoeic name of the game derives from the sound of the marbles tumbling to the base of the tube during play. I coded the sticks in “Plunk” to randomly place themselves within a defined area inside the tube to avoid the setup time and keep things simple, essentially saving time. 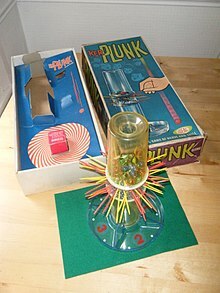 At the start of play, the entire tube is rotated so that a hole in the base of the tube is aligned with the active player’s tray (this part happens automatically once you have played your turn in “Plunk”). Players take turns removing a single straw from the tube while trying to minimise the number of marbles that fall through the web and into their tray. Once a player has committed themselves to a particular straw by touching it, they must remove it. The player who accumulates the fewest dropped marbles wins. The game is manufactured and marketed by the Milton Bradley Company in the UK and by Mattel in the USA. The modern version of the game uses a pink or blue tube rather than the original yellow-coloured tube. There are also other versions of it, such as a Toy Story-inspired version that uses a tube shaped like a rocket ship and Little Green Men figures instead of marbles. In addition, the KerPlunk Game to Go features a collapsible tube, making it more portable than the standard version. Another game has also been released known as KerPlunk 2. The rules are the same, except the marbles that come with the game are coloured and, after falling, move around a spiral pathway similar to that of a gumball machine. It also has flashing lights and an assortment of sounds. I loved playing this game growing up. Collecting marbles was also a thing back then. I did read that some marbles nowadays are fetching quite a price if unique enough and in mint condition. I am about ready to upload to developer console for testing on devices. Hopefully you like what you see? It is a little rough round the edges, but it works. Looking to turn this into turn-based multiplayer game but that is something for another day.